Preface. Contents of previous volumes. 1. Critical behavior and scaling of confined 4He (F.M. Gasparini and I. Rhee). 2. Ultrasonic spectroscopy of the order parameter collective modes of superfluid 3He (E.R. Dobbs and J. Saunders). 3. Thermodynamics and hydrodynamics of 3He-4He mixtures (A.Th.A.M. de Waele and J.G.M. Kuerten). 4. Quantum phenomena in circuits at low temperatures (T.P. Spiller, T.D. Clark, R.J. Prance and A. Widom). 5. The specific heat of high-Tc superconductors (N.E. Phillips, R.A. Fisher and J.E. Gordon). Author index. Subject index. Since 1955 Progress in Low Temperature Physics has continued to monitor scientific achievements in the realm of low-temperature physics. Obtaining low temperatures used to be an aim in itself in the past, whereas nowadays achieving millikelvin temperatures is a routine experimental procedure. However, the properties of materials at these low temperatures contine to produce fascinating physics: the liquid, solid and superfluid, phases of the quantum fluids 3He and 4He as well as 'new' materials such as high-temperature superconductors and tiny quantum devices display their macroscopic quantum behavior only at the lowest temperatures. Volume XIII of this series continues the tradition of collecting fundamental studies of macroscopic quantum phenomena. In this volume, properties of new systems such as small circuits at low temperatures and high-Tc superconductors are studied. But the systems that are formed by 3He and 4He and their mixtures at low temperatures continue to dazzle and amaze with their ever more intricate properties studied with increasing accuracy. 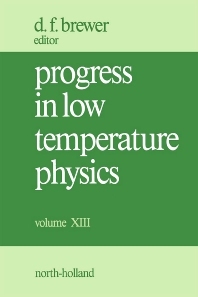 This volume provides the reader with an archival overview of the magic world of low temperatures as perceived by todays most sensitive probes.